George Graham Reviews Shubh Saran's "Hmayra"
During the 1970s when both jazz-rock fusion and progressive rock were at their heights, there were some artists who would mix the genres, bringing jazzy instruments like horns and some jazz rhythms to the elaborate electric arrangements of the progressive rockers. Brand X, which featured Phil Collins on drums, and Yes drummer Bill Bruford’ solo projects were examples of that. More recently on this album review series, we featured an recording by saxophonist Bill Evans which was also in the progress-rock-fusion category. This week we have an impressive new recording by an Indian-born guitarist composer that also spotlights intricate compositions and arrangements with some jazz sensibility and the prominence of horns. It’s by Shubh Saran, and his new release is called Hmarya. Twenty-five-year-old Shubh Saran has lived a rather peripatetic life. Born in India, he lived in Egypt, Switzerland and Canada, before coming to the US to attend the Berklee College of Music in Boston in 2010. His biography said that he spent a year in college in Toronto at a liberal arts school before he decided to devote himself to his music. In India, he grew up with the popular music there, but at Berklee, was immersed in jazz, which he thoroughly absorbed. While at the music school he began performing with his own groups as as a supporting musician for others, including tours to Bangladesh, Vietnam and India. In 2014, he released an EP called A Room with a View which was a bit more toward mainstream jazz than the new album. Its title, Hmayra, according to Saran, is from the ancient Syriac language meaning “hostage” but in the sense of a person who was exchanged between kingdoms in order to honor an agreement. Such Hmayra were often given an exalted position in the kingdom they were sent to, but were still hostages and could not go home. The music on Hmayra is an absorbing and creative mixture of influences, with the Indian sounds rather subtle, more in terms of percussion than the familiar tonalities and instrumentation of the subcontinent. Interestingly, Saran also plays a little banjo. Jazzy saxophones are prominent on almost all the tracks, and the album is rife with the complex interlocking rhythms that can evoke Eastern European folk music. Saran’s role is more the composer and arranger rather than the lead guitarist. In fact, Saran plays relatively few solos, leaving it to the horns and keyboards. The music ranges from angular and edgy sounding to a couple of more melodic pieces. The band on the album includes keyboardist Cale Hawkins, who goes for more vintage analog instruments and acoustic piano, drummer Angelo Spampinato, bassist Mark Minoogian, saxophonists Jared Yee and Brian Plautz, along with percussionist Joshua Bailey who adds some interesting sonic colors without evoking the expected Indian tabla sound. The album closes with Ascent which is well-named with its theme based on rising note patterns, and the way the dynamics of the piece builds to a climax at the end. It provides another good dose of the energy of the progressive rock scene. Hmayra, the new debut full-length album by Indian-born guitarist and composer Shubh Saran is a real standout almost immediately from its start. Its mixture of the elaborate, sometimes edgy compositions of the progressive rock school, along with the harmonic influence and the horn arrangements of jazz and fusion provide great listening for those with a hankering for substantial, multi-faceted electric music. 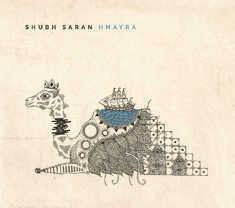 Saran is a first-rate composer and a tasteful guitarist who makes a very impressive showing on this album. Our grade for audio quality is an unqualified “A.” The mix has good clarity, the drum sound is nice and punchy. And most notably is something that is increasingly rare today, the recording was not compressed heavily in the mastering process. So the ebb and flow of the performance and its dynamics are preserved. In a recent interview with the Press Trust of India, Shubh Saran said he hoped one day to go back to India and create music for Bollywood films. I’m sure he would do well. But his new recording of electric instrumental music is at the highest level and should provide some wow factor for prog fans.